Nothing increases the beauty and appeal of your home like the addition of a fireplace. However, installing a traditional fireplace is expensive and messy at best-and in some situations, it's just impossible. That's why we offer our Napoleon B42 Ascent Builder Series 42" Direct Vent Fireplace. It brings the grace and beauty of a traditional fireplace to your home without the expense and hassles. 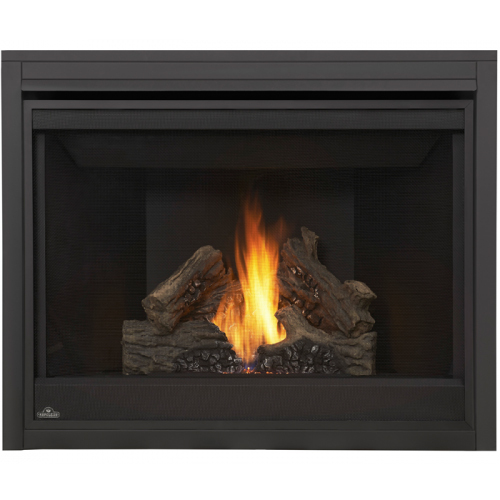 This model comes with a heat-resistant glass door for safety (as well as a fireplace screen), a lovely glowing set of logs on a bed of embers, a pan-style burner, and adjustable heat and flame output. Does this unit come standard with the logs as displayed in the photo? Yes, the log set pictured is included with this fireplace. What is the viewing window for this gas fireplace option? The tempered glass viewing area measures 23 11/16 inches X 37 11/16 inches. What is the viewing area of this Napoleon B42 Ascent Builder series 42 inch direct vent fireplace? The space that will be visible when framed for this fireplace is 42" wide and 34 1/16" high. It wasn't an easy decision to convert to gas after having a wood fireplace for so many, many years. This was the best decision we made. The fireplace is simply stunning, the fire looks so natural and it gives off so much heat. We have used it over and over again since it was installed.